This video originally appeared in the October 1, 2018, edition of AMA's webcast: AMA Air. Find more episodes at http://air.modelaircraft.org. The International Miniature Aerobatics Club (IMAC) organization is a nonprofit AMA Special Interest Group that focuses on pilot education, the maintenance of rules and guidelines governing the sport, and promoting RC Scale Aerobatics. IMAC has grown to represent and organize RC Scale Aerobatics competition on a global level. In 2014, the first IMAC World Championships (IWC) was held at the International Aeromodeling Center (IAC) in Muncie, Indiana. This event set the bar high for future IMAC events and international flying competitions. On September 4-8, 2018, the second IMAC World Championships was held at the IAC in Muncie. This world championship again set a high standard for modern RC competitions. 2018 IMAC World Competition Parade of Flags, with 79 pilots from 18 countries participating. There were 79 pilots from 18 countries who traveled to Muncie for the IWC. More than 35 individuals also traveled to Muncie to give their time and ensure that the standards of the 2014 World Championships were exceeded. The theme was “Continuing to Build International Friendships.” This theme was naturally carried on by the pilots as soon as they arrived. Pilots, their crews, and IWC staff instantly began renewing old friendships and forging new ones. It is truly stated that this sport introduces you to friends from all over the world. The week started with practice on Monday and Tuesday. There were two flying sites at the IAC and other local club fields offered their sites for practice. Greg Dial (Team USA) competed in Intermediate with his Carden Extra and took fifth place. The IWC event staff included Mike Karnes, contest director; Steve Sides, event director; Phil Vance, assistant event director; Doug Pilcher, operations manager; and Rosie Pilcher, assistant operations manager. On Tuesday afternoon, a pilots’ meeting was held for the pilots and their crews. Safety was a big topic, as well as the itinerary and flying processes that had to be followed by each pilot and his or her crew. The pilots not only had to worry about their flight times, they also were required to participate in scribing and calling activities for the judges. All of this made for busy days! While the pilots met, the judges had a meeting to review the rules and go over scenarios and how each scenario would be handled. This helped in many cases when a situation arose and required quick action and decisions. The other crews, such as the scorekeepers who had to set up the scoring office and be prepared for when the score sheets started coming in, also met. Claude Vallieres (Team Canada) and his caller wait their turn while another pilot completes a flight for the judges. After the meetings, the opening ceremony began appropriately with a “Parade of Flags.” Each country carried its national flag onto the flightline while the national anthem of its country played. The teams were cheered with enthusiasm and many sang their anthems with gusto! After the last country paraded in, all were welcomed and invited to participate in a photo. This was a large group, and the photo impressed upon us the span of friendships that modeling, AMA, and IMAC have brought together. After the picture was taken, the teams were dismissed to continue visiting and preparing for “wheels up” at 8 a.m. the next day. IMAC competition brings out many colorful and beautiful aircraft that sit on display while not in the air. Wednesday began with a beautiful sunrise, little wind, and low humidity. It could not have been better weather. The competition was held on two flying sites, Sites 3 and 4. Each flying site had two flightlines. The Unlimited and Advanced classes flew at Site 3, and Intermediate and Sportsman flew at Site 4. That meant that after the flying started, there could be as many as four airplanes in the air at each site at the same time (or eight airplanes in the air total). That’s a lot of coordination to keep it working smoothly. This coordination was done by the team of flightline bosses: Randy Foster, Site 3, line one; Skip Kixmiller, Site 3, line two; Alan Batts, Site 4, line one; and Kevin Schmidt, Site 4, line two. Sacha Cecconi (Team Italy) takes on the challenge of being the first Freestyle pilot to fly in the rain. One new benefit at the 2018 IWC was the addition of web-based score posting. The pilots were given a website address where they could see the latest round’s results and the current standings. This was an intensive process that started with a great team of seasoned scorekeepers, including head scorekeeper Phyllis Youngblood and assistant scorekeepers Rhonda Vance, Samantha McKinney, Jenna Johns, and Terri Foster. The judges were Bill Teeter, Canada; Charles Youngblood, US; Henny Van Loon, Netherlands; Jim Daly, Canada; Peter Bryner, Australia; Rich Whitlow, US; Emilio Moreno, Spain; Brad Davy, US; Joe Ryan, US; Peter Nesbeda, US; Andrea Migliorini, Italy; Esther Gómez Viana, Mexico; Steve Stanton, US; Michael Verzwyvelt, US; Carlos Forero, Colombia; Peter Castine, US; Paco Pineiro, Spain; Michael Roxberry, US; and Shane Snyder, US. “Fiddy” Kal Reifsnyder (USA) practices his Unknown sequence. With the first day in the books, the jitters were worked out and everyone was tired from a full day of flying. The Unknown sequences were given out for the next morning and everyone packed up to rest, study their Unknowns (even the judges! ), and prepare for day two of the competition. Thursday started as a beautiful day. The early Unknown maneuvers were flown, and the Known rounds began. Things ran smoothly and the flightlines were ahead of schedule. This was a good thing because the weather turned and flying had to be stopped for approximately an hour. Despite the weather, all rounds were flown, and the day ended complete. 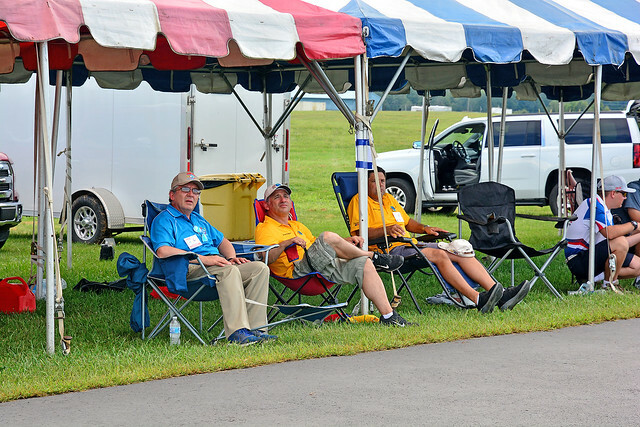 Although the rain didn’t keep pilots from flying, it did keep everyone else under the tents. Friday morning was quite a different story. The pilots woke to rain, which continued throughout the day. A decision was made at 3 p.m. that anyone who wanted to compete in the Freestyle contest would be allowed to fly, rain or shine. The Freestyle portion of IMAC allows pilots to set a routine to music, express the music artistically through their flying, and show off skills in precision and 3D flying. Many were skeptical that any pilots would take up this challenge as it continued to rain, but Italy’s Sacha Cecconi stepped up and flew the first Freestyle flight. This flight was met with great appreciation from the crowd that had been waiting around in the rain! In the end, 12 pilots braved the wind and rain and flew Freestyle routines, with only one dead-stick landing in the round. This was a great tribute to the pilots who raced against the elements to show off their skills after traveling so many miles to get to this moment. Unfortunately, Freestyle was the only round flown on either Friday or Saturday, so this round effectively ended the 2018 IWC competition. Steve Sides, event director, addresses the participants at the banquet. To wrap up the week, everyone met at the Horizon Convention Center in downtown Muncie on Saturday night for an awards banquet and to share their experiences from throughout the week. Steve Sides emceed the event, and Mike Roxberry blessed the delicious dinner. Six trophies were given for each class and three trophies were awarded for Freestyle. After the individual awards were handed out, awards were given for the top-three finishing countries. These team awards were calculated by the raw score for the top-three competitors of each country, across all classes. Next was the announcement that the 2022 IMAC World Championships would be held in San Giovanni Rotondo, Italy. There is much excitement about this upcoming event and continuing the tradition of this world competition. Throughout the week, Shane Snyder shot video and put together a presentation showing the first-place winners and a tribute to two individuals who we lost in 2018. The entire Team USA, which took first place, poses for a photo at the banquet. As many know, John Schroder passed away before the 2018 Nats were held in July. John was a great friend of IMAC, the founder of Clover Creek Aerodrome, and a great champion to the IMAC Junior pilots. Only a few weeks before the IWC, Allen Eklund, who was slated to be one of the line bosses, passed away. Allen was also a great friend of the IMAC community and had many close, personal friends involved with the championship. These two gentlemen are greatly missed but will be with us forever within our sport. After the video, all mingled, took pictures with trophies, teams, and friends, and eventually headed back to their hotels or campers to prepare for the trip home. This event, although shortened by weather, was tremendous and brought a lot of people together to not only compete but enjoy one another’s company. It is a sign of the strength of our sport and the friendships that it forges between us. We look forward to convening again in San Giovanni Rotondo for the 2022 IMAC World Championships!